As we go on in time, our bayous continue to get crowded as more people begin to enjoy the outdoors on the water. While out on the water, there are things that we should think about often. These things range from boating safety to being courteous to other fellow sportsman. Way too often, someone gets upset because a fellow sportsman, experienced or not, does something careless or just plain rude on the water or at the dock. Even though every sportsman is responsible for their actions, there are times that actions occur due to inexperience or improper guidance or, no guidance. On some very few occasions, you will find that one rude person where all the training in the world wouldn’t help. They are going to be just that, Rude. Listed below are a few guidelines that will help everyone enjoy our waters just a little bit more. Keep in mind that these are just some guidelines and are not the exact rules of the bayou. Even with my many years of experience on the bayou, I would not claim to be an expert nor would I claim to be perfect. A complete list of rules can be found in the boating section of the LDWF website. You can also find information on boating safety classes, which at this time, are required for anyone born after January 1, 1984. When launching, it is best to be prepared ahead of time. Have things set up to go before pulling up to the ramp. This could range from putting the plug in to removing straps. I like to do this in a tie down area or in the parking lot. It makes things go a lot smoother when the ramp is crowded, such as it can be on the weekends. After you launch, if you are at one of those smaller ramps where there is only one back down ramp, move the boat to the side out of the way, if it is provided. This keeps the ramp clear for the next guy waiting to launch. The same goes when returning to the launch. Dock the boat off to the side until you have the trailer backed down into the water.Preparation of the boat for the road should be done in the tie down area. While out on the water, be aware of your surroundings at all times. Never create a wake when leaving or returning to the launch. In Louisiana, there are laws that regulate wakes within certain distances of launches. You should consult the LDWF website for accuracies on these laws. The same applies to areas around camps on the bayou. No one wants their boat banged up against the dock by someone throwing a wake. 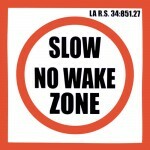 Most no wake zones will be marked with a “No Wake Zone’ buoy or sign. When we think of “no wake zones” we shouldn’t always think of it related to a specific area. There are times when we should consider our surroundings. If you are in a bayou, passing a boat where someone is fishing, slow down and idle past them. They will appreciate it. You will also appreciate it when someone else does the same for you. When fishing amongst others, keep a distance. If you can cast your lure into their boat, you are probably too close. If you are out in one of our many lakes or bays and plan to fish a shore line, use your trolling motor to motor up to the spot. This helps you to not scare off any fish as well as prevents ruining the fishing for someone else in the area. Your trash is just that, your trash. Keep it in your boat and dispose of it in a proper manner when you return to the launch. Throwing refuse fishing line overboard can create big problems for wildlife as well as other sportsmen. Plastic bags can be sucked up against water intakes on outboards, thus possibly burning up a motor. Fishing string and such can become wrapped around wildlife and wrapped into propellers. All of this can be prevented by taking a little effort to dispose of it in a proper manner. Many launching facilities offer a place to dispose of trash. Please use it. As far as the fish you keep, that is up to you. I always stay within the laws on what I keep. It’s cheaper that way. Bigger is not always better. I can say that I would much rather keep a 18?-20? redfish over a bull red. Simply put, they taste better. Always have the safety equipment aboard that is required. Not because it is the law but, because it could save you. These include but are not limited to life jackets, throw-able flotation devices, paddles and a fire extinguisher. If your motor is equipped with a kill switch with a lanyard, attach it to you. It is there for a reason. Many of us, including myself at times, are guilty of not taking advantage of it. You should never leave the dock if you know in the back of your mind you may need a tow. Although this could happen to any of us, at any time, if you feel your vessel is not up to par for a trip, stay on land. Having said that, if you happen to come across someone whom is stranded, lend them a hand. You could be the last person to come across them and nothing is worse than spending a night on the water with no help. This is something I once experienced myself back in the days before cell phones. Trust me, it is not fun. Filing a float plan is also a good idea. It will let others know where you are going. Should something happen, they will know what area to look in. You can click here for a copy.